We are recruiting seven Full-Time Officers and many Part-Time Officers to join our team for 2018/19. This is a fantastic opportunity to develop your skills whilst working with a student-led charity organisation to make positive changes to student life. Full-Time Officers will work on exciting initiatives whilst receiving training in leadership, project management and much more. Joining as a Part-Time Officer means you can get involved with an aspect of student life you have a passion for and gain useful volunteering experience to help your CV stand out from the crowd. Want to find out more? We are holding three Drop-In Sessions with our current Full-Time Officer and Coordinator teams who will be available to answer your questions. Find out dates and times here. Nominations are open until Monday 05 February at 13:00. 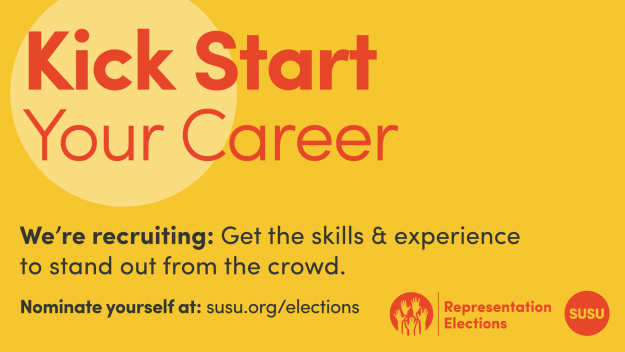 Take the next step in your career and nominate yourself at susu.org/elections. « Amazon Lockers: an update!